Releasable cable ties are used for prototype work where wires will be added or when a tie is needed for a temporary application. Standard and specialty cable ties are available in many sizes and styles. 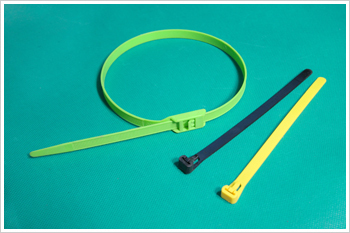 Nylon zip ties are used for securing hoses, wire, tubing, etc. Most ties are available in white or ultraviolet resistant black (recommended for outdoor use when ties are exposed to sunlight). The releasable cable ties has an added release tab permits easy release and re-use where changes are anticipated during development, production, or servicing in the field. Head design with waiting position allows temporary positioning of tie prior to final locking. No need to replace ties when adding more cables to bundle.